Make the Poached Peach Halves Combine the wine, sugar and spices or herbs, if using, in a 4-quart saucepan and heat to just under a boil over low heat, stirring to dissolve the sugar. Gently place the prepared fruit into the warm poaching liquid and cook, turning the fruit in the liquid as needed, until it is tender, 10 to 15 minutes. Using a slotted spoon, gently remove the fruit from the poaching liquid and allow to cool on a plate. Once it has cooled, the fruit can be stored in an airtight container, covered with the poaching liquid, in the refrigerator for up to 3 days. Make the Salty Graham Gravel Preheat the oven to 275 degrees F. Combine the graham cracker crumbs, seeds, flour, cornstarch, sugar and salt in a small bowl. Add the butter and stir until large lumps have formed and all of the dry ingredients are moistened (the mixture should resemble lumpy wet sand). Add the salt, mixing just enough to distribute it evenly. Pour the crumbs onto a baking sheet and spread evenly. Bake the crumbs for 10 minutes. Remove the pan from the oven and toss the crumbs with two bench scrapers or metal spatulas, then chop into 1/8 – 1/4-inch pieces. Bake for 10 more minutes, or until the gravel is a rich brown. Remove from the oven and let cool completely. Make the Sweet Cream Ice Cream Mix about 2 tablespoons milk with the cornstarch in a small bowl to make a smooth slurry. Whisk the cream cheese and salt in a medium bowl until smooth. Fill a large bowl with ice water. Combine the remaining milk, the cream, sugar, and corn syrup in a 4-quart saucepan, bring to a boil over medium-high heat, and boil for 4 minutes. Remove from the heat and gradually whisk in the cornstarch slurry. Bring the mixture back to a boil over medium-high heat and cook, stirring with a heatproof spatula, until slightly thickened, about 1 minute. Remove from the heat. Gradually whisk the hot milk mixture into the cream cheese until smooth. Pour the mixture into a 1-gallon resealable plastic freezer bag and submerge the sealed bag in the ice bath. Let stand, adding more ice as necessary, until cold, about 30 minutes. Remove the frozen canister from the freezer, assemble your ice cream machine and turn it on. Pour the ice cream base into the ice cream machine canister and spin until thick and creamy. Pack the ice cream into a storage container. Press a sheet of parchment directly against the surface of the ice cream and seal the container with an airtight lid. Stash the ice cream in the coldest part of your freezer until firm, at least 4 hours. Make the Fresh Raspberry Sauce Puree all ingredients in a blender. Pour into a small bowl, cover, and let sit in the refrigerator for at least 2 hours to allow the sugar to dissolve. Assemble the Peach Melbas Scoop the ice cream into 8 serving bowls. 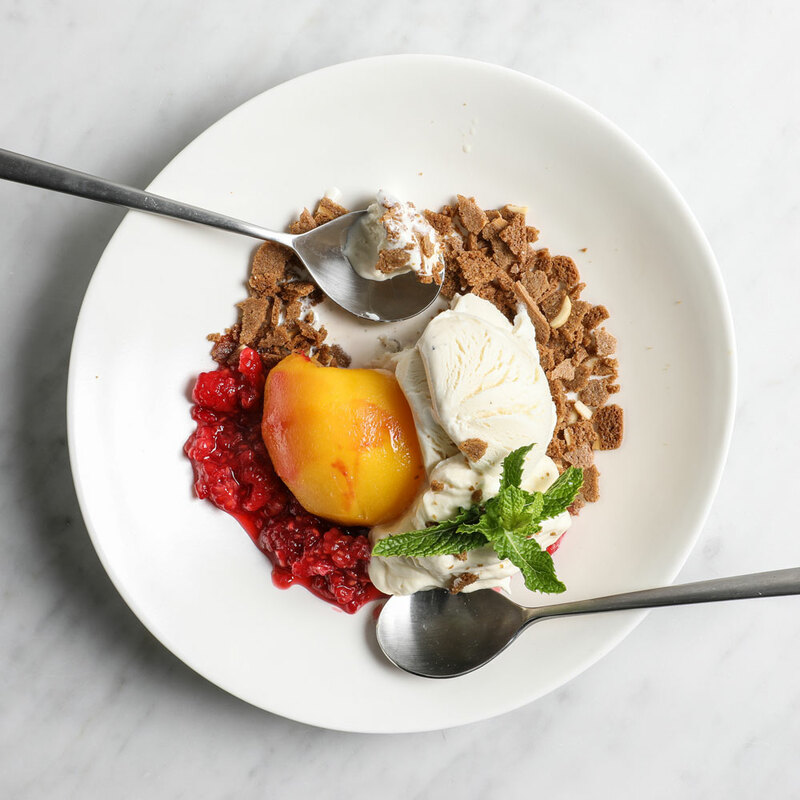 Place one poached peach half in each bowl, top with the fresh raspberry sauce and sprinkle with the salty graham gravel. Serve right away.